Yes, I’m still alive. As much as I love parenthood it doesn’t allow much time for blogging. Also, until recently I haven’t been doing any gaming, and as a result the only (infrequent) updates to this site have been maps. However that may be changing. A few months ago my wife and I rebooted our Islands of Mist hexrawl campaign with a new party. We’ve only managed to game on average of once or twice a month, but it’s been enough to encourage me to carve out a bit of time for more adventure design. Thus in the months ahead I’ll be periodically adding more content to the site, including a complete redux of my Mythbinder ruleset (aimed at quicker play), some of the adventure supplements promised in Isles of Mist, and as always, more maps. I’ll begin with the Hightop Dungeon adventure of hex 1003. 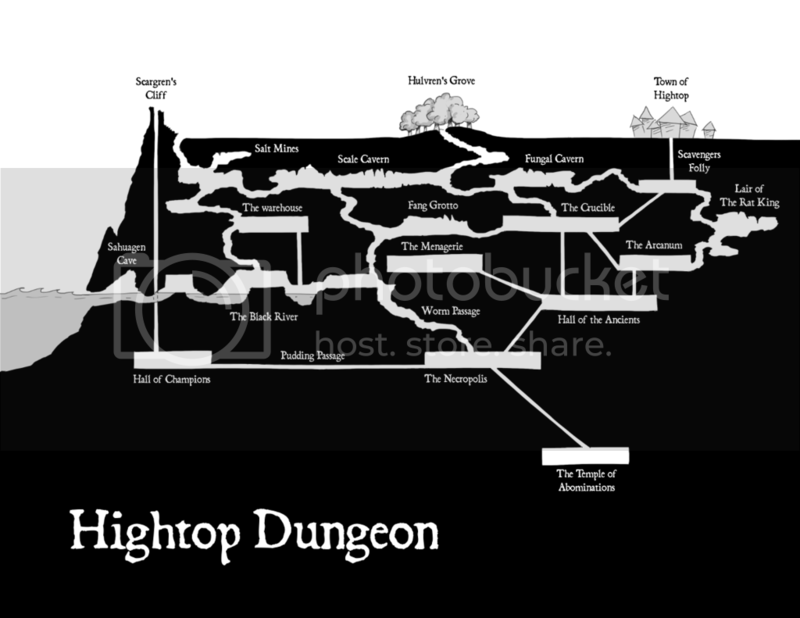 The above map is of the town directly above the dungeon. As indicated in the entry for this locale, one of the few known entrances for this dungeons is located within the Golden Feather Inn. I plan to provide a bit more info about the keyed entries on this map in a separate post sometime next week. Following that I will be tackling floor maps of the dungeon. In the mean time, here is a side view of the dungeon to peek your interest.